An examination of the structure, condition and selected aspects of the management of the Beijing urban forest. This article is based on original material from Su Ming, Deputy Chief of the International Programmes Division in the Foreign Affairs Department, Ministry of Forestry of the People's Republic of China; and from George Profous, Senior Forester, New York State Department of Environmental Conservation. It has been adapted by S. Dembner, Editor of Unasylva. Since the founding of the People's Republic of China in 1949, the Chinese Government has given high priority to urban afforestation. In the early 1950s, Chairman Mao Zedong initiated a campaign to promote tree and flower growing throughout the country. The response was strong, both in terms of spontaneous and planned planting. For example, in the 1950s many housing complexes, primarily three-storeyed and built around green, tree-lined courtyards, were built with the help of Soviet specialists. However, it was recognized that further measures and incentives were necessary if tree-planting was to keep pace with population growth. Over the past two decades, legislation and regulations related to both general and urban tree-planting, have proliferated. In 1979, the Central Committee designated 12 March as national tree-planting day and, in 1981, the fourth session of the Fifth National People's Congress adopted the "Resolution on the unfolding of a nationwide voluntary tree-planting campaign". This resolution stipulated that every able-bodied citizen between the ages of 11 and 60 should plant three to five trees per year or do the equivalent amount of work in seedling, cultivation, tree tending or other services. Supporting documentation instructs all units to report population statistics to the local afforestation committees as the basis for workload allocation. Moreover, those failing to do their duty are expected to make up planting requirements, provide funds equivalent to the value of labour required or pay heavy fines. Therefore, the tree-planting campaign is actually compulsory, or at least obligatory (that is, an obligation to the community). The "voluntary" in the title referred to the fact that the tree-planters would "volunteer" their labour. It is claimed that at least 1000 million trees have been planted in China every year since 1982. The 1982 Provisional Rules and Regulations on the Forest and Garden Management of Cities (Ministry of City and Rural Construction and Environmental Protection) declare that historic, rare and large trees are state property. The regulations further state that their presence should be documented, marked and protected. All urban trees are protected and new trees are planted in order to maintain an ecological balance, improve the environment and beautify the city. The removal of trees requires the permission of the appropriate local government authority. 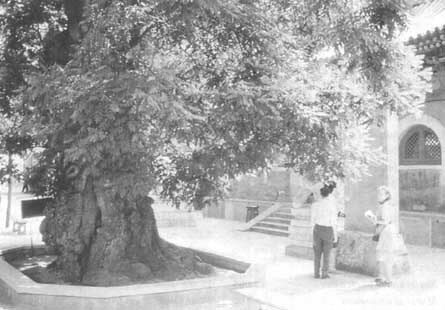 In its Opinions about Strengthening the Management of Historic and Rare Large Trees of Cities and Scenic Areas (1982), the Ministry of City and Rural Construction and Environmental Protection states that historic and rare large trees have been damaged for a long time because of a lack of protection and management. The ministry proposes to give a better definition of historic and rare large trees; survey existing trees; provide professional management and public participation in the process; enforce protective actions; establish new incentives and fines; and educate people. A study of 439 cities in 1991 put the total area of urban green space at 380000 ha. This translates to an average per caput share of vegetation-covered space in cities of 4.1 m2, amounting to a mean coverage of 20.1 percent in the country overall. Some 40 percent of the country's cities have more than 30 percent green cover. Located on the northerly edge of the North China Plain, Beijing is ringed by mountains ranging up to a height of approximately 900 m. The climate is continental monsoon with cold and dry winters (January mean temperature 4.7°C), and warm and humid summers (July mean temperature 26.1°C). The metropolitan area covers 16800 km2 and more than 60 percent of it is mountainous. The city's central urbanized area is 400 km2 and is part of a larger central city planning area of 750 km2, inhabited by more than 9.2 million people. Beijing is situated within an area of deciduous broad-leaved forest but centuries of overcutting throughout China have resulted in a very low per caput forest area. In 1949, forest cover in Beijing was 3.2 percent; most trees were found only in areas around Buddhist and Taoist temples. Most other trees were destroyed during conflicts with invading Japanese armies. Moreover, during the Cultural Revolution (1965-1975) many more large and historically significant trees were destroyed or damaged. Nonetheless, the Beijing metropolitan area has more than 40000 trees identified as being more than 100 years old while some are over 1000 years old. Under the "voluntary" tree-planting campaign, large numbers of trees and shrubs - perhaps as many as 500 million (Beijing Linye Jianshe, 1989) - of many species have been planted, first in and later around Beijing. A study by Profous, (1990) identified more than 90 different species in the Beijing metropolitan area. Of the more than 90 shrubs and tree species identified in the inventory conducted by Profous, four genera (Populus, Sabina, Sophora and Robinia) comprised almost 55 percent of the total. Another 24 percent was made up of Siberian elm (Ulmus pumila), maidenhair tree (Ginkgo biloba), Shantung maple (Acer truncatum), tree of heaven (Ailanthus altissima), panicled golden rain tree (Koelreuteria paniculata), lilac (Syringa spp.) Peking willow (Salix matsudana), ash (Fraxinus spp. ), paulownia (Paulownia spp. ), pine (Pinus spp. ), silktree (Albizia julibrissin) and sycamore (Platanus orientalis and P. acerifolia). Fruit-trees make up 16 percent of the Beijing urban forest, particularly Ziziphus jujuba, Toona sinensis and Diospyros kaki. Shrubs make up 18 percent of the urban forest. Today, green cover in Beijing has reached 26 percent or about 6 m2 per person (Yu, personal communication). 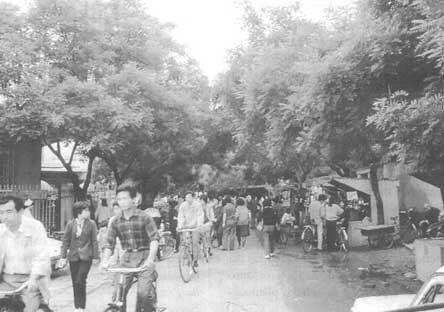 By 1982, Beijing had some 64000 km of closely spaced street trees - set at distances of only 3 to 4 m (Hill and Mahon, 1982). This short distance is attributable to a number of cultural and practical reasons. The government mandate to increase green space rapidly was certainly a factor. Furthermore, by planting the trees closer together, the roots are shaded and the bark and canopy are protected from extreme temperatures and winds. 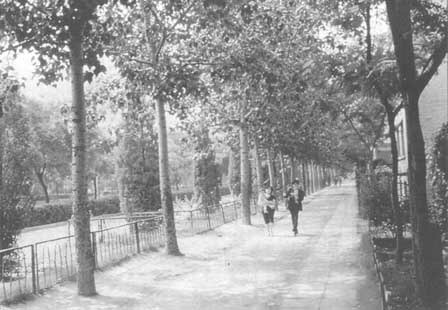 From a historical perspective, the origins of the Chinese design for closely spaced street tree-planting can be at least partially traced back to regulations enacted by Kublai Khan in the thirteenth century, requiring trees to be planted only two paces apart along both sides of all public roads, both for shade and as road markers during snowy winters. The resulting pattern differs strikingly from Western models, which tend to depend on their canopies for visual effect; in China it is the trunks that dominate the view. All large roads are planted with at least two tree species, often in two or more rows, and wider planting strips are often used along large boulevards. Forest bands of up to 30 m in width have been planted along the major thoroughfares crossing the city as well as along roads leading out of the metropolitan centre. In suburban areas, there are concentric, although unconnected, bands of forests while, in the outer counties, more than 10000 ha of protection forests have been planted to reduce wind and dust in the city (Yu, personal communication). The Municipal Bureau of Forestry has encouraged the cultivation of fruit-trees and nut trees. Fruit-trees make up on average more than 17 percent of the trees in all of the areas sampled in the Profous study (1990). In the city's older, single-storey residential housing areas, fruit-trees make up an average of 23 percent of all trees and in some areas the percentage is as high as 42 percent (e.g. West Hutung). More than 40 varieties of fruit are grown in the metropolitan area. In Profous' study, common jujube (Ziziphus jujuba), Chinese toon (Toona sinensis), persimmon (Diospyros kaki), pomegranate (Punica granatum), apricot (Prunus armeniaca), peach (Prunus persica), Persian walnut (Juglans regia), apple (Malus spp. ), mulberry (Morus spp.) and Chinese hawthorne (Crataegus pinnatifida) were the most common fruit-trees. With rare exceptions, all of these trees are planted within courtyards or adjacent to residential homes; with the occasional exception of walnut, fruit-trees are not used as street trees. The fruit-trees are supplied to residents upon request (when available) by the municipal government through government or farm nurseries. However, they are privately planted, managed and harvested. In addition to the provision of food, a number of the fruit-tree species are also valued for their medicinal properties. For example, ginkgo (Ginkgo biloba) provides edible nuts and is also used in the treatment of tuberculosis. Fruit-bearing ginko (i.e. female trees) are forbidden on streets, however, in order to avoid problems with the messy and bad-smelling fruit. Old and historic trees in Beijing are concentrated in palace and temple gardens and parks. Chinese junipers (Sabina chinensis), Chinese arbor-vitae (Platycladus orientalis) and Chinese pine (Pinus tabulaeformis) are particularly revered for their straight stems as symbols of longevity. All parks in the Beijing area are fenced off, charge an admission fee and allow only pedestrian traffic. Nonetheless, most parks receive heavy use, resulting in widespread soil compaction and destruction of under-storey vegetation, despite intensive maintenance. At the Temple of Heaven (constructed between 1400 and 1550 AD), many of the large trees have crown dieback and some appear to have been struck by lightning. Trees that are 100 years old or more, or that have a special historic significance, have been inventoried and tagged by the Beijing Institute of Landscape and Gardening: green tags for trees in good condition, red tags for trees in need of special care and maintenance. A number of the red-tagged trees are being treated by soil aeration and fertilization in an attempt to stem their decline. In the Summer Palace, 10 km northwest of the old city gates, there are large areas of rock-hard soils and heavily compacted paths surrounding the old trees in the formal gardens as well as the somewhat younger trees throughout the informal hills and glades of the park. It appears that most of the trees along the extremely heavily travelled walkways would not survive if planted today. All property in Chinese cities is publicly owned so there is no distinction between public and private green space. However, the lack of private landownership appears to have little effect on compliance with regulations or on the level of care given to trees by residents, who appreciate and treat them as their own. 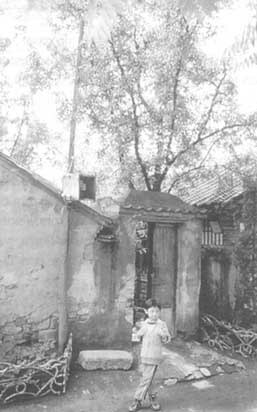 Informal regulations have long prohibited the removal or cutting (by either individuals or local administrative units) of any tree that has grown "taller than a building" or is more than 100 years old, without approval from the Beijing Forestry Bureau and notification of the Beijing Institute of Landscape and Gardening. The Institute of Landscape and Gardening has jurisdiction where fewer than ten trees in one location are to be removed. If more than ten trees are to be removed, permission must also be granted by the Municipal and Gardening and Landscape Administration. In any case, a tree must be diseased or so damaged as to create a dangerous situation or removal permission will not be given. If permission is granted, a resident may remove the tree or pay the Institute of Landscape and Gardening to do so. All wood must be returned to the Institute, thereby discouraging deliberate damaging of trees. Although rarely required, there are heavy fines for cutting trees without permission. For example, the penalty for cutting a tree of 10 cm in diameter without permission is a fine of 300 to 500 yuan; the average monthly base salary is 150 yuan (US$33). Each city district has a planting bureau in charge of tree maintenance. These bureaus must also obtain permission from the city's central planting office to remove, cut or prune trees. Small streets and lanes are managed by the local bureaus, while the City Parks bureau is responsible for larger thoroughfares. Species decisions for planting are taken by the City Planting Office, in consultation with district bureaus and the Institute of Landscape and Gardening. The Beijing Institute of Landscape and Gardening operates four large nurseries covering a total of approximately 670 ha. Other nurseries in the Beijing area, covering a total of 335 ha, are managed by the Ministries of Forestry and Agriculture. Private farm nurseries also produce planting stock for reforestation of mountain areas and urban planting. Farmers prefer to sell to the Beijing Institute of Landscape and Gardening, as they pay proportionately higher prices for the trees used in urban landscaping. Generally accepted international standards of approximately 3 cm in diameter (six to eight years of age) are used for urban ornamental plantings. "Green fence" or hedge species, widely used in gardens, buffer zones and as traffic dividers along boulevards, may be four to five years old when outplanted. Seedlings for hillside afforestation are planted out at two to three years of age. One of the four large nurseries run by the institute of Landscape and Gardening is Tongbeiwan Nursery, near Ziangshan Park. The nursery produces more than 180 species of conifers, deciduous trees and shrubs, fruit-trees, grafts, vines and flowers on its 155 ha area. In 1989, the nursery was growing an average of 24000 plants per hectare. Seedlings are supplied for planting out in mid-March or October, depending on the species, based on request of the district planting offices. As the actual species planted in a given year reflect the requests from district planting offices, they may be considered somewhat indicative of public preferences (see Box, for species and quantities planted in 1989). Over the course of the past decade, significant progress has been made in China's urban afforestation programme. Many cities have achieved dramatic improvements in the environment for production and human subsistence. 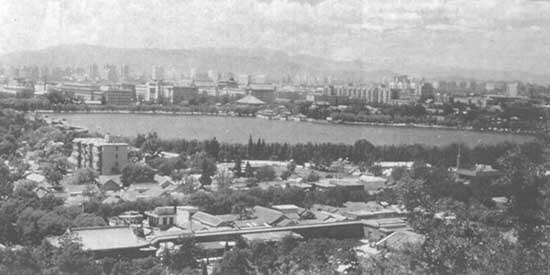 In Beijing, for example, the current green space cover is 28 percent compared with the 3.2 percent of 1949. However, many of the cities in China still have large areas yet to be afforested and, even in cities with significant tree cover, there is still much room for improvement. In order to improve urban afforestation and accelerate greening throughout the national territory, the Chinese Government has designated a panel of senior scientists to elaborate a "Compendium of the National Afforestation Plan 1989-2000" which sets out the aims, overall layout, priorities and detailed work plan for afforestation efforts up to the end of the century. Beijing Linye Jianshe. 1989. Construction of Forestry in Beijing. Beijing Bureau of Forestry. Boerner, D. 1986. Forester to forester in China. Am. Forests, September 1986, p. 36-41. Hill, J. & Mahon, C. 1982. China's street trees. Places, 3(3): 70-72. Hook, B., ed. 1982. The Cambridge Encyclopaedia of China. Cambridge. Cambridge University Press. Profous, G. 1990. Report: The structure and management of the urban forest in Beijing, the People's Republic of China. New York, Northeast Forest Experiment Station, USDA Forest Service. Richardson, SD. 1990. Forests and forestry in China: changing patterns in resource development. Washington, DC, Island Press. Wang, C.W. 1961. The forests of China, with a survey of grassland and desert vegetation. Cambridge, Maria Moors Cabot Foundation. Xu, L.A. 1989. Forêts et foresterie en Chine. Rev. Forestière Fr., 61: 353-359.